Congratulations to our Sacred Six Winner of the Month, Marcedes Barksdale! Marcedes has been a nurse for one and a half years but has been in healthcare for eleven years. She is a graduate from ATA college. She is a wonderful mother of three, Jeremiah, Micaiah, Elijah. She is happily engaged to her awesome fiancé, Eric. She loves caring for people, and being “extra.” She wanted to become a nurse because of her father. When he was in the hospital, she saw how the nurses treated him and took care of him. This inspired her to further her career in healthcare. 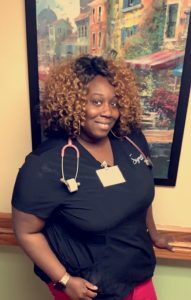 We are so grateful to have this wonderful, caring nurse call our facility her home.